Steiff bears must be the number one name in the bear collecting world. 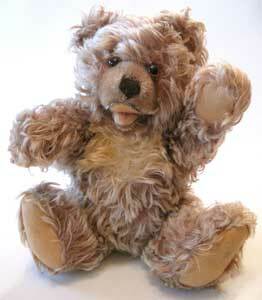 Everyone has heard of Steiff and the fact that they are one of the earliest producers of teddy bears in the world. I'm sure every collector has one or would like one to be amongst their bear collection. Steiff are known for their quality and to this day they still make bears to a very high standard and so still command a high price. Because the company has been making teddy bears for such a long period there are many options for the bear's collector as to what era they would like their Steiff bear to come from. Of course very early Steiff's are very sort after and as such are extremely high in price, but there are many price options for the collector and the bears of this page will give you a range of price possibilities. Some of the best deals are available are on Ebay. 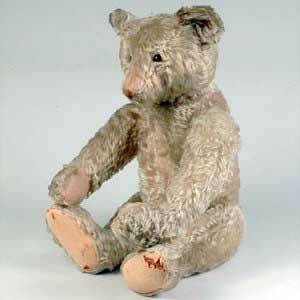 1904-05 Rod Bears - Stuffed hard and their joints are made from rods. They have sealing wax noses. A new fashion for less realistic looking bears encouraged the Steiff Company into making bears with shorter arms, rounder heads and no hump. The button in the ear is the famous Steiff trademark but there were variations of button and other accompanying labels along the way too. Between 1904 and 1905 the button in the ear was simply marked with an elephant whose trunk was shaped like an s.
Between 1905 and 1950 a silver button with the word Steiff printed on it was used. This was often accompanied with a cloth label. From 1908 this was a white label and between 1934 and 1950 it was yellow label. 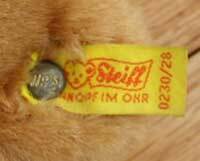 Between 1952 and 1972 the button in the ear had the word Steiff written in cursive script and was accompanied with a yellow label. Zotty Steiff bears also had a paper tag on their bib identifying it as a Zotty bear. Other bears made after the 1960's also had a paper tag attached to their chests which had the words "original Teddy" on them.